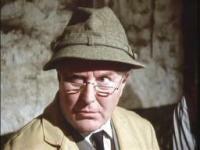 Robert Hardy (b. 29 October 1925 d. 3 Aug 2017) was an English actor with a long career in the theatre, film and television, beginning in 1959 when he appeared as Sicinius opposite Laurence Olivier in Coriolanus at Stratford-upon-Avon, directed by Peter Hall. Since then he has appeared in many Shakespearean roles. His first continuing role in a TV series was as Alex Stewart in The Troubleshooters (1966-1970), but of course he is most well-known as the senior veterinarian Siegfried Farnon in the long-running All Creatures Great and Small (1978-1990). He is also most notably associated with playing Winston Churchill in Winston Churchill: The Wilderness Years (1981), for which he won a BAFTA award. More recently he has become recognised by the younger generation for playing Minister of Magic, Cornelius Fudge in the Harry Potter films. He has appeared in numerous films, on stage, on radio and in such television productions as Elizabeth R. - and it was while he was playing Malcolm Campbell in Speed King (1980) and the title role of John Fothergill in Fothergill (1981) with the BBC that Ian Wallace (who was also working on those productions as Production Associate) met him and invited him to become a Patron of The Young Theatre. He was made a CBE in 1981, and in 1996 he was elected a Fellow of the Society of Antiquaries. He stood down as a Patron of The Young Theatre in 1996. Please read Ian’s memory of him. 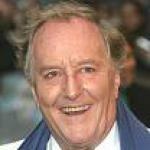 I first met Robert Hardy on the afternoon of my birthday in 1979, when a number of the cast and crew assembled the day before the start of shooting for Speed-King in which Robert was playing Sir Malcolm Campbell in the story of his continual search for land speed records. It was my first production working with BBC Drama Plays and producer Innes Lloyd (one of the best producers I ever worked with) and I wasn’t terribly sure of what was usual and what wasn’t. Robert was, after all, a star but Innes put me at my ease in what turned out to be a very relaxed atmosphere. It was therefore a surprise later that afternoon when I received a phone call inviting me to have dinner with Robert and Innes at their hotel. It turned out to be a small dinner party of (I think) six of us, with excellent food and wines (Robert was quite a wine buff) and I thoroughly enjoyed it - and then, at the end of the meal, the waiter brought in a small birthday cake which was presented to me to the accompaniment of the traditional chorus! Robert had decided that my birthday had to be celebrated. It was a lovely gesture from somebody I’d only just met - but as I found out over the next couple of years, typical of him. Having got to know him quite well working on Speed-King, (by the end of which I had been included in that group of friends and colleagues who could call him Tim) we met again a year later when we were both working on Fothergill - again with Innes producing, and it was during the shooting of this BBC Playhouse film that I approached him about becoming a patron of The Young Theatre. He told me to let him have all the necessary information, which I did, and two days later he told me that he would be delighted to become a patron of the group, although he said that it was unlikely he could do much more that lend his name, but if that was worth anything then he was agreeable! I can also remember on one occasion him giving up part of his lunch break during this filming to meet, greet and be photographed with a group of elderly ladies who had visited the location on the off-chance of seeing him. Typical of the man. Regrettably I didn’t get the chance of working with him again. As he said himself, he liked to “keep busy” and over the years he played many and varied roles, and in more recent times he looked to be enjoying his appearances as Cornelius Fudge, Minister of Magic in the Harry Potter films. Whilst he was obviously well-known as an actor, he also had other strings to his bow, in both the literal and actual sense, being an acknowledged authority on the long-bow, and he wrote two books on the subject Longbow (1976) and The Great War-Bow (2004). It’s worth saying that, given the opportunity, he was easily persuaded to share this expertise! Yes - at times he could be difficult and irascible; he was someone who had variable moods, and you had to be as much of a perfectionist at what you were doing as he was at what he was doing, but I admired him as an consummate actor, enjoyed working with him and found that off-screen in relaxed mood he was a charming, interesting and fascinating person to be with.